The Accentuated Gemini Element, Moon-Venus in 2nd House, Dharma-Karmadhipati Rajyoga – Highlights! Pandit Hari Prasad's Mercury (planet of versatility and skill), the Ascendant lord makes good combination with his natal Sun, the planet of rise and shine and natal Mars planets of actions and energy in the Gemini Ascendant . Mercury, the planet which represents versatility and skill, happens to be the Lord of the Ascendant in the Horoscope of Pandit Hari Prasad Chaurasia. Moreover, Ganesha says that the Horoscope of Pandit Chaurasia is not too hard to decode and comprehend. He is born in Gemini Ascendant, and this Airy Sign represents exceptional talents, great skill and the things and musical instruments related to the airy element. The combination of the Lords of the Ascendant, the 3rd House and 11th House in the Ascendant itself renders great powers and skills to Pandit ji. This also represents a great connection between the power of the self and potential (Ascendant), the talents, hobbies and skills (the 3rd House) and the realisation of ambitions and wider recognition (11th House). The above mentioned combination in the Ascendant further gets empowered and enhanced due to the aspect of Jupiter from the 9th House and due to this the powers of the trio present in the Ascendant gets accentuated. One House that plays a very important role in the Horoscope of a flautist is the 2nd House. One look at the 2nd House and we can make out that Pandit Hari Prasad is a special artist, who has been blessed by extraordinary talent and artistic brilliance. The combination of Moon and Venus in the 2nd House, and that too in a watery Sign is surely a great blessing for an artist, and here the Lord of the 2nd House, the Moon is placed in its own Sign Cancer. The 2nd House represents the vocal chords, the throat, the mouth and the lips. These are the areas that are important for a flautist and the presence of the planets which represent arts, music and creativity in this House shows the natural talent of Pandit Hari Prasad. There is an exchange of Houses between Jupiter and Saturn as the Lords of the 9th House and 10th House, and this is no ordinary exchange, but a Parivartana Maharajyoga, and to be specific, it is a Dharma-Karmadhipati Parivartana Maharajyoga! This explains the extraordinary fame and success that Pandit Chaurasia has achieved so far! It is only such highly This also renders enormous power and benevolence to the Chart. This also denotes that the native is spiritual and pious by nature. 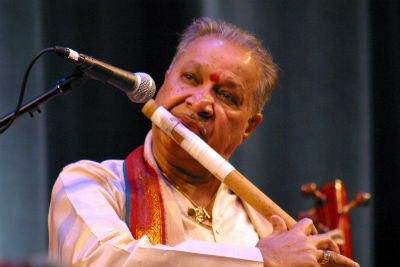 On a conclusive note, Ganesha says that due to a beautiful synthesis of various planetary combinations as mentioned above, Pandit Hari Prasad has been able to achieve such prominence and success in his life so far and he is an inspiration for many budding music and flute enthusiasts all over the world. Ganesha wishes good luck to Pandit Hari Prasad Chaurasia.